The number of casualties from cold exposure continues to rise as most of Europe experiences freezing temperatures. Dozens of people have been reported dead across the continent - many of them rough sleepers. Among the casualties was a man, 75, in the Netherlands, who fell through the ice while skating on Wednesday morning. He was pronounced dead in hospital. But despite the dangers, many Europeans have been enjoying the icy weather. Winter sports have erupted across the region, from skiing on city streets in Britain and France, to skating and sledding in countries where snow is rare. Seaside resorts in the south of France and northern Spain - where the average lows in winter are still well above freezing - experienced rare snowfall. Places like San Sebastián in Spain saw heavy snowfall on the beach, while Catalonia warned its residents to avoid driving. Reality Check: Is snow getting rarer? The cold spell spread as far south as the Mediterranean, bringing Rome its first snow in six years on Monday, and to the far northwest, where Ireland prepared for its heaviest predicted fall in decades. Britain, meanwhile, continued to struggle with transport delays, and Scotland received a "red" snow warning for the first time ever - indicating a risk to life. The cold spell, nicknamed "the Beast from the East" in the UK, is carrying freezing winds across the continent, and temperatures as low as -30C (-22F) reported on German mountain peaks. In different parts of Europe, the weather has been given alternative names. To the Dutch, it is the "Siberian bear", and the "snow cannon" to the Swedes. On Tuesday, snow was seen on the site of the ancient city of Pompeii, near Naples in southern Italy - where the average February temperature is 6-14C. In Paris, where temperatures dipped to -6C, commuters shared pictures of stalactites on the walls of at least two metro stations. The full extent of fatalities caused by the cold is difficult to report, as each country monitors such deaths independently. 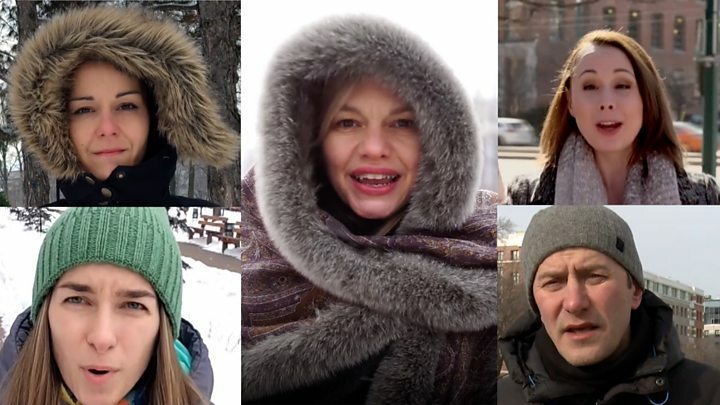 The AFP news agency has been keeping its own toll, and said that at least 46 people had died since Friday in connection with the cold. At least five people died in Poland, while four deaths were reported in France, including a nonagenarian who was found outside the gate to her retirement home, AFP reports. Three deaths were confirmed in Lithuania and two in Romania, including an 83-year-old woman found collapsed in the snow. A 47-year-old homeless man died in the Italian city of Milan. Emergency shelters have been opened by many authorities to cope with the needs of homeless citizens. In Belgium, police were allowed to detain people overnight if they refused to go to shelters. Germany's homeless association said a woman had died in a forest near Leipzig on Monday. Its director, Werena Rosenke, urged homeless shelters to remain open as long as possible, warning that people could also die during the day. The International Federation of the Red Cross and Red Crescent Societies appealed to the public to check on at-risk neighbours. "Just knocking on someone's door to check they have everything they need can make a huge difference," its Europe director, Simon Missiri, said. "It could even be the difference between life and death." BBC Weather predicts milder temperatures in Portugal and Spain on Wednesday, by heavy snows in the Pyrenees and Alps. "We expect more disruptive snowfall - another 30-40cm to come for the Alps," BBC meteorologist Helen Willetts said. "Strong winds are driving ahead of this snow, so blizzards are expected - the avalanche risk is very high indeed." But she added that temperatures could rise in the early part of next week. Reality Check: Where in the world is snow getting rarer?